#UNIZIK pre-science form — The management of the Nnamdi Azikiwe University (UNIZIK), Awka, is now selling forms for admission into its pre-science / pre-degree programme for the 2018/2019 academic session. 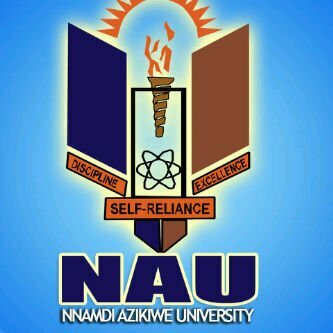 Applications are hereby invited from suitably qualified candidates for admissions into the Nnamdi Azikiwe University (UNIZIK), Awka, pre-degree programme for the 2018/2019 academic session. Candidates Eligible to Apply for UNIZIK Pre-Science Admission. Candidates intending to apply must register for the 2019 Joint Admission and Matriculation Board (JAMB) examination. The minimum academic qualification is five O’ Level credits which will include English, Mathematics and any other three relevant science subjects in SSCE, NECO, GCE and NABTEB at not more than two sittings. The candidate must also satisfy the basic O’Level requirements for the department into which he or she is seeking admission. For example where Chemistry is a basic requirement as in the case of Medicine the candidate must satisfy that requirement at O’Level. e. Department of Applied Micro-biology and Brewing. How to Apply for UNIZIK Pre-Science Admission. The form can be purchased in any of the banks nationwide at a cost of N8, 000.00 (Eight Thousand naira) only. Continue with the application by logging in with the login credentials sent to your email. Print the RRR (Remita) page; proceed to any bank of your choice nationwide to make a payment of N8, 000 only. Login to the portal, click on Step Two, click on Confirm Payment, enter the RRR number and click on verify payment. If payment confirmation is successful, or if you get notification payment already verified, then proceed to Step Three. Click on Step Three, click on Fill Application Form, Fill out the application Form. You can save each stage of the application and continue at a later time. Also you can edit your information as often possible. However, once you submit your application, you cannot edit again. Print out the Application Form as your copy.